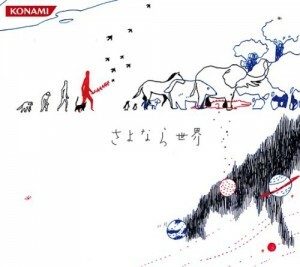 Sayonara Sekai is the second album by Naoyuki Sato with songs from his NekomataMaster alias from various BEMANI games, also including a number of new original tracks. Sato’s NekomataMaster alias makes use of a signature light electronica sound often with added asian and exotic instruments, at times giving the song a feeling that transcends settings or time periods. These works are distinct from his NekomataMaster+ alias which is reserved for his harder style tracks. On this second album, Sato continues to explore the NekomataMaster sound, bringing more of what made the first album Raindrops work, while also allowing in some influences in from his NekomataMaster+ alias. The album begins with two new tracks. “signal” is a static-filled introduction to the album, obscuring the “sora” melody. It doesn’t have much more function than that of an atmospheric opener, but it’s short and it works. The static builds and suddenly is wiped clean, leaving “sora.1” to surface. It starts simply with an exposition of the melody as on a music box. It’s a short but haunting little phrase, which Sato then transfers to a waltz on piano. He later brings back the music box alongside a melodion, which adds some of characteristic folksy sound. There isn’t too much to the short piece, but the melody really is a winner. It returns for the closing of the album, “sora.2”. Also short track, Sato instead focuses on an arpeggiating harp with the melody on piano with some ocean sound effects. The piece feels a bit more mysterious here, and leaves the album on an intriguing note. The other new tracks on the album are full-length tracks, each departing from Sato’s more typical pop-style composition with lyrical melodies. The first of these is “abyssal node”, which starts off in an atmospheric soundscape with repeated arpeggios and space sound effects. Some percussion begins to build with filtered synths before brining in the more recognizably NekomataMaster synths. There ultimately isn’t too much going on in the piece that is engaging, but it is an interesting departure for Sato, being much more spacious than his usual output. “Haiiro no Machi” is similar in composition style, and begins with some light piano work and a tint of jazz before adding on some exotic percussion. Some electronic elements are found throughout, and in the end this piece works a bit better than “abyssal node” thanks to its wistful wind instrument taking the central melody later on. The last new track is “Kagerou no Mori”, which builds off of a chiptune foundation before going more overtly tribal. It’s not a bad track either, but like “abyssal node” and “Haiiro no Machi” it isn’t too remarkable, especially in light of the stronger material on the album. Four vocal tracks are included on the album, and as with Raindrops these tracks are quite strong. Continuing his relationship with Sana, Sato enlists her vocal for three of these tracks. “Ookina Koe de” is first, with a lighter tropical sound mixed Sato’s signature percussion and piano. The tropical sound is a welcome new influence, and the track is quite fun and laid back. Later, the new track “To Your Hand” adds to backing strings alongside some electronica elements, while “Sayonara Sekai” mixes strings with an acoustic band. Both are fantastic slower tracks, and the latter in particular is quite poignant and beautiful. The last new vocal track is “Tegami”, with Maki Nagayama on vocal. Nagayama’s voice is much more mature and airy, giving the song a bit more weight. The arrangement that follows the track is beautiful, mixing some spacious strings with a slightly experimental backdrop and trickling piano phrases. Really great stuff in the vocal songs, and it should be noted that all of this is in the singers’ native Japanese, so there are no off-putting awkward pronunciations here. Sato does have a share of his more typical sounds on the album, though there are some signs of growth. “not eternity” is a light, folksy track that utilizes most of Sato’s exotic sound library in an overall pleasant and catchy piece. “Byukuya Gentou” and “Tree in Lake” are much more oriental in their influence, and are a bit more exciting and tribal. “Tree in Lake” also has a neat throwback at the bridge to a track from his previous album, “Sayonara Heaven”. It’s a shame the melody doesn’t extend past that into the final chorus, though. “bloomin’ feeling” is a world electronica remix of one of Ryutaro Nakahara’s tracks, and has been slightly re-arranged from its appearance on starmine. It’s much more mysterious an intriguing than the original Nakahara track, if a bit typical for Sato. “tori-no-kimochi” and “Silence” are perhaps a bit to similar to each other, both being more upbeat world electronica, though their positive atmospheres make the tracks enjoyable. Although it’s a lot more of what we heard previously on Raindrops with just a bit more emphasis on electronica, Sato’s lyrical melodies and fun atmospheres make these tracks more than listenable. Aside from the more typical sounds, Sato really outdoes himself on two of the album’s tracks. “Sky of Sadness” has some of NekomataMaster+’s Arabian influences, but also some great swirling violin work and a sense of urgency. It stands rather uniquely among Sato’s repertoire, but it still fits in to the album while feeling fresh and exciting. “Far east nightbird” sounds much more like a NekomataMaster+ composition, utilizing a drum’n’bass foundation and with Sato’s lighter electronica elements above it. It’s not a particularly lyrical composition other than its chorus, but it is still utterly addictive, with a number of distinct sections (with some disorienting yet very alluring polyrhythmic transitions). Through its course, the song manages to grasp some feelings of longing, but also excitement and danger. It’s one of the most compelling tracks I’ve come across, and the extension on the album allows it grab on even stronger than the original does. On Sayonara Sekai, Naoyuki Sato plays it a bit safe as far as his NekomataMaster alias goes, bringing more of what we’ve come to expect. However, this isn’t to say that any of it is bad, and the album is still very enjoyable with a unique style. The new tracks unfortunately aren’t too remarkable other than the vocal tracks which are fantastic and stand far above the typical Bemani vocal fare. Sato’s existing work also justifies the album, and the extensions added to them are all fine, not being egregious copy-and-paste jobs for the most part. In addition, “Far east nightbird” in is an incredible work, nearly justifying the cost of the album alone for any fan of Sato’s work. It doesn’t take his work in a whole new direction, but Sayonara Sekai is still a wonderful addition to Sato’s portfolio. Posted on April 24, 2015 by Christopher Huynh. Last modified on April 25, 2015.